Learn about the perils of changing the cross filter direction to "Both", then discover why the CROSS FILTER function is better! 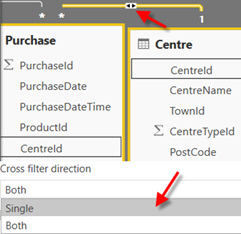 This blog shows how and why you might use the CROSSFILTER function in DAX to change the join type used for relationships. Obviously a single product can have been sold in many different centres. I'm not saying it's impossible, but it does seem unlikely that all products are sold in all stores. Each purchase has listed next to it the product sold (ProductId) and the location it was sold at (CentreId). This allows a single product to show only relevant purchases, but that is where the filtering ends. 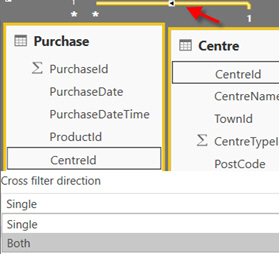 Double click the join between the Purchase and Centre tables. Looks great - but with great Power BI comes great responsibility. Looking good with no filters. What happens when I try filtering my table using the ProductName slicer? Some of the CentreNames have vanished! They are now showing only centres which sold the product Bob. I wanted to count the centres that sold particular products, but I didn't want to affect all future calculations and visuals! Filtering by centre should change which products you see, but changing the products shouldn't impact on the centres displayed: ie the relationship should be one-way only, from parent (centre) to child (purchase). You can use the CALCULATE function to change the filter context for a calculation (such as the relationship between two tables). CROSSFILTER takes in the columns from each table used to join the tables together, and lets the users indicate the direction of filtering allowed. Just like we did previously in the relationship view, but this time only for this one calculation! The measure is showing the number of stores for each product as if a Both relationship existed, while the count shows the relationship doesn't exist! Has this fixed our slicers from being affected? Yes it has! All centre names are showing, not just those Bob is sold in. This lets me work out how many regions each Product is sold in. The Region table is 3 relationships away! To see these relationship measures in action, click here.